Lingenfelter, Richard E , “Steamboats on the Colorado River, 1852-1916 ,” Arizona 100: Essential Books for the Centennial, accessed April 21, 2019, http://speccoll.library.arizona.edu/online-exhibits-dynamic/az100/items/show/291. From the first vessel (a small, well-worn machine named the Uncle Sam) to the boom years of the 1860s and 1870s, the swarm of steamers led to the establishment of landings from as far south as Port Isabel (now a mud flat in the Colorado River delta) on the Gulf of California to Colorado City at the southern tip of Nevada. 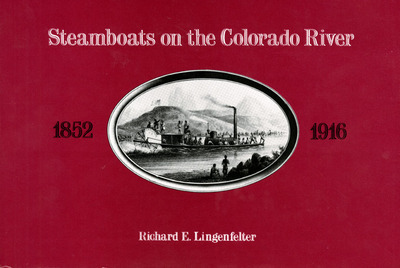 Lingenfelter, in excellent prose, covers the entire river, including unsuccessful efforts spanning twenty years to run steamboats through the canyons in the upper stretches of the river all the way to Wyoming. xv, 195 p. : ill. ; 20 x 29 cm.